Pearson Report: Moving on... I had a good run with it, but now I'm done. I should have known better - even in my days of winging it time constraints were huge. I own a business, and tax time is April here in Canada - so, it has always added extra stress. I don't think I need more stress, and on top of that my Theme was not thrilling me. While I enjoy playing AC Pocket Camp there are other things I enjoy more - like my Flash Fiction writing. So, with that - I'm moving on. Not ready, and not having fun with my Theme. I should have known better. As I said to Annalisa there are other things I would have had more fun with, like a little bit of Flash Fiction. Anyway, I'm not stressing, one way or another it's all good. Thanks for always stopping by and giving your support, much appreciated. Oh well... on to more enjoyable things... 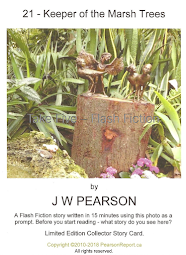 Flash Fiction, which I adore. Hi Jo-Anne, thanks for dropping by. I'm on the same page. Lately I have too much other stuff taking up my time and attention. I had hoped my AC Pocket Camp Theme would be doable - it wasn't, too many photos to take. It didn't give me the joy I had hoped it would. Those that do this A to Z are definitely amazing! Oh, dont do that! Its fine if you don't want to stick to a theme. A theme is useful in only guiding the choice of words. This is my 2nd time and I had drawn up a draft list of topics. But each entry has been changed and the posts are coming spontaneously. That's the fun of it all. Hi Anupama, thanks for stopping by. From the start, back in 2011 I enjoyed winging it - writing and posting on the same day - it was great. Then, in 2015, when I assisted Arlee Bird (founder of A to Z), I pretended to use a theme, had a calendar and everything, but actually winged it on a daily basis too. This year, I had sequel in the wings, but at the last minute I opted for the Pocket Camp theme - bad call. That said, I found myself not feeling the joy - so I wrapped it up and called it a day. I'm okay with that decision. Enjoy the challenge, I'll drop by and give your posts a read. This shouldn't feel like a chore! So just keep posting what you want, when you want. The world has not come to an end...just your alphabet! Have a happy day of exploring your world, and post again when you have a mind to!!! Hi Donna, thanks for stopping by. I posted about books I've enjoyed this past two weeks. Maybe if the mood moves me I'll post another one in about 2 weeks with the next batch I'll have devoured.